The story itself takes place in Darien, a city ruled by the 12 families, a puppet king above them all. A strange but tenuous balance exists. It is a land where magic exists, though not in terms of spells and potions, but abilities and tools. When General Justan, commander of the Immortal army decides that he no longer abides by this balance, each will have a role to play in his success or failure. Elias, Arthur, Nancy, Vic Deeds, Lady Sallet and others all have their own strengths and abilities, each of which can help keep or else destroy the state in this decaying empire. In terms of fantasy writing, it was well done. The world he has created is well developed, and you get a sense of the history of the place (a legacy of writing so much historical fiction). The pacing is excellent, and the story moves forward in such a way that keeps the reader interested. 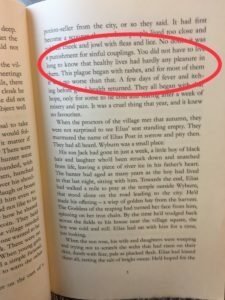 The character development is lacking – each of the characters in the book has the potential for so much more, but we’re just given a taste of who they are, and as a reader I definitely felt a void because I would have loved to know a bit more about them (particularly Nancy, Lady Sallet and Tellius). More time was spent on backstories of characters that don’t necessarily have an important role in the larger scheme of things, so it felt like time that could have been better spent elsewhere. Also, he spent too long on some sections, while others could have benefitted from more detail, to help get into the story. That being said, all in all, an enjoyable read, and enough dangling threads for the reader to look forward to book two. Next postWhat Would a Mediocre Man do?